We tend to forget what a wealth of plants North America has to offer. During the early days of exploring, many collectors came to North America in search of new plants to feed Europe's horticultural appetite. Before the Asian continent was opened for European trade, it was considered the height of fashion (as well as a show of wealth) to have gardens rich in North American floral exotic's. In America, gardening with native plants seems to go through waves of popularity. Many native prairie styled perennials like Coneflowers and Black Eyed Susans have enjoyed a renaissance over the last decade. Lots of new cultivars have entered the maketplace with varying heights and colors, increasing their popularity for use in our gardens. However, native woody shrubs have been lagged behind with the same range of choice. One shrub though that is stepping out of the shadows is our own native Anise, or Illicium floridanum. 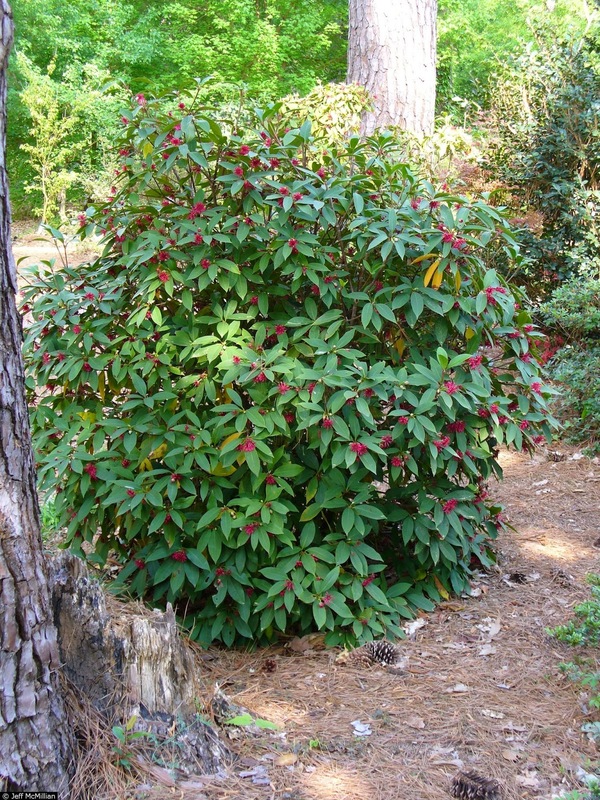 I first encountered this shrub when a customer presented me with a photo of an evergreen shrub, much like a Rhododendron, but with deep crimson star-like blooms. Some how we managed to name this plant as a Illicium but there it remained as just a photo for a few years. More recently I've began to noticed more mainstream nurseries listing it and every year newer varieties seems to be dribbling out from production. My own garden boasts a couple of varieties with room still to add one or more as the selection of choice continues to grow. No longer is it just found as a typed listing in a mail-order plant catalog. Listed as a threatened species, Purple Anise is native of northern Florida and Georgia's moist woodlands, spreading into coastal plain areas of Louisiana. Given its southern location, I have found it grows quite well in my colder zone 7, Northern Virginia garden. This evergreen shrub reaches heights of 6-10 ft tall in an upright, but rounded habit. The foliage is elliptical, smooth and glossy, which when bruised will emit an spicy anise-like aroma. The Latin word 'illicium' means allurement, referring to the aromatic properties of this plant. Although a close cousin to the Asian Star Anise (Illicum verum), don't be fooled into thinking of consuming it as its highly toxic. Nodding dark red flowers appear from April into May and emit a fishy fragrance when up close, but tend to be overshadowed by its glossy foliage. Plants do best in areas where they don't receive the hot afternoon sun and needs organically rich, moist but not excessively wet soil. So given the fact that the flowers are fishy and the foliage is toxic, why grow Illicum? Easy, its one of a few native evergreen shrubs for shade that deer detest and secondly, there's a lot of different varieties now to choose from. Below is a list of some of the varieties that have passed through the garden center at different points. 'Florida Sunshine' - A chance discovery by Tony Avent of Plant Delights Nursery, came across some unusual seedlings grown by Florida plantsman, Charles Webb. After several years of evaluation, one was selected for its bright chartreuse yellow foliage and brilliant red young stems. My own plant is still to young to flower but not much is said in references online about it. One article did comment that the bloom color is near white and doesn't show against the foliage very well. It can suffer with leaf burn if exposed to too much winter sun and is best located in partial sun to shade. Smaller in height at maturity than the straight species, this shrub will act like a beacon in a shadier corner. 'Haley's Comet' - Awarded the Pennsylvania Horticultural Societies 2009 Gold medal, 'Haley's Comet' is an all round improved variant over the species. Bigger and better blooms appear in large numbers over an extended period. It has shown better cold tolerance and faster growth than others and is mentioned to be tolerant of dry shade once it gets established. 'Pink Frost' - This was discovered in 2003 as a sport or branch mutation growing from another variety of Illicum called 'Shady Lady'. Upon evaluation, 'Pink Frost' showed dramatic improvements in form over its parent plant. A well branched habit with outward held creamy margin leaves. During colder temperatures or when new growth appears in spring, the creamy margins are replaced with a pink tint, leading to its name. Flowers are a deep maroon-red that really pow against the foliage. I also find the aroma produced from bruising the leaves to be much sweeter when compared to others. 'Shady Lady' - This 1989 discovery had been in underground circulation until recent popularity in the group forced it into the spotlight. Discovered by Dodd & Dodd Native Nurseries of Alabama, this variety has a brighter creamy white splashing of color across its green to blue-green foliage. The foliage also has a crinkle to it that adds some textural qualities. Flowers are a soft peachy-pink but are hard to distinguish against the riot of foliage color. A worthwhile cousin to mention, although not as flashy, is the Yellow, Star or Ocala Anise Tree, Illicum parviflorum. A native to Florida's central moist woodlands and swamps, this evergreen shrub or small tree does equally well in Virginian gardens too. It is slightly bigger than the Purple Anise at 10-15' tall and 6-10' wide and can colonize through root suckers. The olive green foliage emits the same fragrance as all Anise shrubs and is left alone by browsing animals. Yellowy- green flowers appear in late may but for the most part go unnoticed. Mostly for these reasons it lends itself well to hedging as it lacks the drama and refinement that the Purple Anise has and responds well to shearing and training. Best growing in moist sites in light shade but can tolerate more sun as long as they are provided with uniformed moisture. These variations may not keep the species true to form but it does improve its marketability. 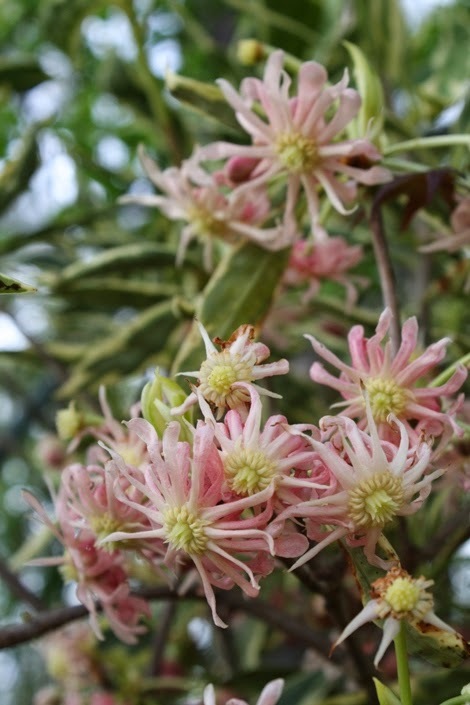 Through the work of many nursery people, this obscure and little known shrub is beginning its march to becoming a potential mainstay of domestic landscapes. Any time you can find a plant that isn't favored by deer it becomes worthy of attention, and this plant deserves all the respect in the world. March on!